It seems timely at the moment, what with yesterday’s re-opening of the old Walsall court house in its new/old incarnation of Saint Matthew’s Hall, to speak of libraries in Walsall, with their old and honourable tradition of service to the town and its people. 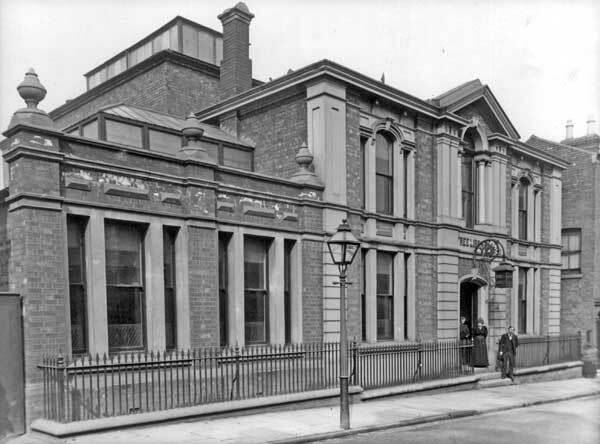 Many of you reading this will be regular users of Walsall Central Library in Lichfield Street, but how many realise that this particular building is more than a century old, and that libraries as an institution in Walsall go way back in history? The first public library in Walsall was a paid subscription library established in 1800 by one Thomas Bowen, a Unitarian minister, in his Rushall Street home. This was moved, by 1813, to a room at Valentine & Throsby’s stationery shop in High Street. A permanent, purpose-built library, however, was first constructed in Lichfield Street, in 1830-1. This magnificent Georgian building, originally named Saint Matthew’s Hall, still exists, on the corner of Leicester Street, in what we call Leicester Square. The building, one of the most imposing in the town, is of Greek Doric design, built in brick, stone and stucco, and fronted by a tetrastyle portico. This early library originally contained a large hall, which was at one time divided into news and reading rooms, surrounded by a first-floor gallery. The library was not a commercial success, and by 1847 the building was in a state of disrepair, and it was sold to C.F. Darwall, Clerk to the Magistrates. 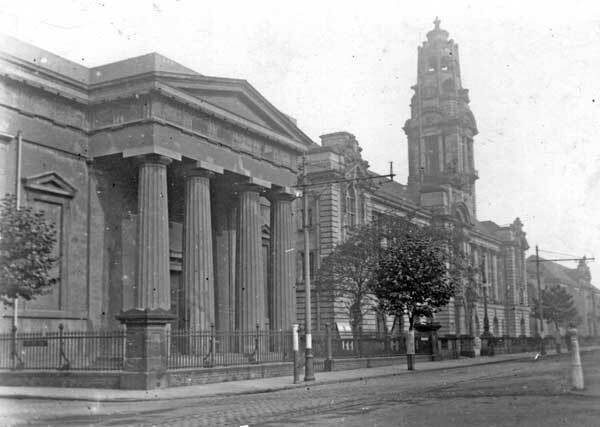 In 1851 it had become a savings bank, but between 1853 – 1855, Mr. Darwall modified it so that it could house the Walsall County Court offices as well as a lecture hall on the ground floor plus a Freemasons’ hall on the first floor. Following the sale to Darwall, the contents of the library and newsroom had been transferred to John Russell Robinson’s printing works on The Bridge, roughly where Millets shop stood until a year ago. The books and papers remained there, latterly under the care of his son, W. Henry Robinson, a prominent printer and publisher, until 1875 when the subscription library was closed down and the books were presented to the new Free Library (see below). The history of Saint Matthew’s Hall did not end there, however. In the 1990s, the County Court moved to Upper Bridge Street, to the former Co-op Kenmare House, and the Old Court House became a popular bar, restaurant and nightclub. Over the years that also became run down, and having had a short period as a Martha’s Vineyard, it closed last year. Yesterday, however, this fine old building came full circle in a way – it re-opened under its original historic name of Saint Matthew’s Hall – as a library-themed Wetherspoons pub celebrating the history of Walsall. I wish them luck with their new venture. 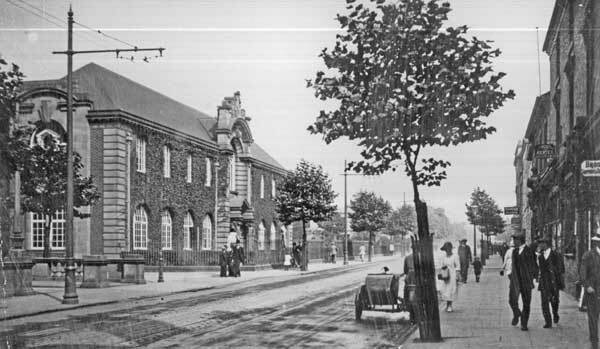 In 1857, Walsall adopted the Free Libraries Act, and a new building was opened in 1859, in Goodall Street, where it remains today. In 1872 it was converted into a newsroom, and a library and reading room built over it. 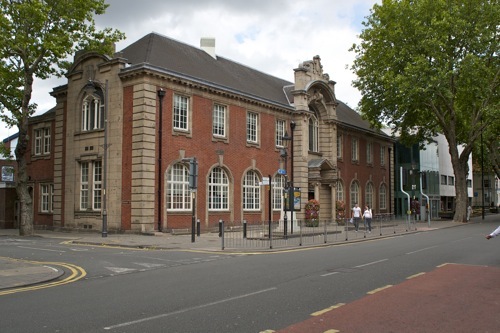 The building was extended in 1887, and in 1890 the upper room was modified to house an art gallery, museum and reference library – direct ancestors of those same institutions in 21st century Walsall. The Free Library in Goodall Street was replaced in 1906 by the much larger and more central new Free Library present Central Library in Lichfield Street. It was built with funds provided by the famous Scottish-American businessman and philanthropist Andrew Carnegie, who founded many libraries and also donated the enormous dinosaur skeleton cast which is to be found in the foyer of the Natural History Museum in London. J. Gibson of London designed the new Walsall Library in the Baroque style. In 1965, a large extension was built on the right hand side of the Library, and named the E.M. Flint Gallery after Miss Ethel Mary Flint, herself an artist and chairman of the Borough’s Library & Art Gallery Committee. The controversial (because of its radically different modern architecture) extension housed an art gallery as well as rooms for lectures and exhibitions. In 1967-8, a Museum of Leathercraft was established there, using items from the Museum of Leathercraft in London, which eventually transferred its entire collection to Walsall in 1971. 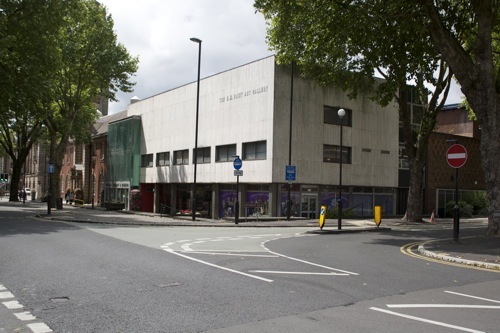 In 1974, the first floor of the ‘new’ Free Library building – by then known as Walsall Central Library – was reorganised as an art gallery housing the Garman-Ryan Collection, which was given by Lady Kathleen Epstein in 1973. The ground floor of the extension became the Children’s Library, where it remains today, and part of the upstairs became Walsall Museum’s Local History Gallery. Following the completion of the New Art Gallery at Town Wharf in 1999, the Garman-Ryan Collection was removed to the new building, and the old gallery became vacant. In due course it was refurbished and rebuilt as a superb specialist public Reference Library and Flexible Learning Centre. Transferred from the ground floor of the Library and dramatically expanded, the busy and popular new facility offers the best in reference books, periodicals and business information as well as public internet access, multi-media, video conferencing, word processing and homework facilities. In summer 2002, the familiar main entrance of the historic Central Library was closed, and a new entrance in the form of a 21st century glass atrium was created between the original building and the E. M. Flint gallery extension housing the Children’s Library. The space vacated on the ground floor when the Reference Library moved upstairs has been used creatively to extend the Lending Library, adding a remarkable air of spaciousness to the newly refurbished room. At the same time, a public lift was added in the atrium, offering greater convenience for the disabled and the many other visitors wishing to visit the Reference Library and Walsall Museum. Sadly, due to the spate of government cuts since the last general election, Walsall Museum’s busy and popular temporary exhibitions gallery – the E.M. Flint Gallery as was – was mothballed earlier this year, and several staff made redundant, leaving only the otherwise excellent Changing Face of Walsall gallery and associated Education Room. Today, Walsall’s old Central Library – the Carnegie Free Library – retains much of the character of the original genteel establishment, representing nearly two centuries of librarianship in the town, while continuing to push forward the boundaries of what is now know as information science. Using modern technology undreamed-of by Walsall’s first librarians, the people of the borough, young and old, can now take full advantage of computerised resources and the internet, exploring both books and the realm of cyberspace in the Flexible Learning Centre at the Central Library – and in many of its borough-wide branches. In the enlightened spirit of its predecessors, making information and learning available to all, it is to be hoped that, despite it seems inevitable future cuts, the modern 21st century Walsall Central Library and its several fine branches around the borough will continue to be vitally important centres for public access to knowledge, culture and entertainment in the town for many years to come. Excellent start to your new blog Stuart. I look forward to reading more soon. Thanks Roger, not sure about the opening times but will try and find out!